ANZAC I hear you say? You aren’t from down under are you? It stands for Australian and New Zealand Army Corp, established during World War I. It’s ANZAC day next Saturday (and my brother’s birthday – happy birthday Tim!). 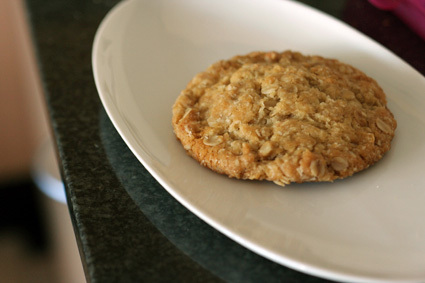 ANZAC biscuits are eaten year round, but more so on April 25. I started baking early, testing out a recipe I haven’t used before. ANZAC biscuits are always made of rolled oats, flour, coconut, sugar, butter, golden syrup, bicarbonate of soda and usually boiling water. There is never any egg in the recipe and they mustn’t be called cookies! It’s the rules. No egg I guess means the cookies biscuits didn’t spoil during the trip to soldiers stationed overseas. The exclusion of egg also made the biscuits cheaper to bake, as eggs were costly during wartime I have read. ANZAC biscuits are sweet, crispy and addictive! The golden syrup does make the biscuit special. I used this recipe from Woman’s Day magazine. The recipe was advertised on the cover and contents page of the magazine, but I could not find the recipe in the magazine itself. Perhaps someone got to it before I did or perhaps I didn’t look hard enough. Either way I found it on the website. The recipe is good, tasty in just the way ANZAC biscuits should be. ANZAC biscuit recipes usually vary only in the amount of each ingredient. I cooked most of the mixture in the common size – place a walnut-sized amounts of mixture on to trays for biscuits roughly 8-10cm wide. I also made 3 large biscuits and cooked them until they were almost done. The result was soft and chewy and sweet biscuits. Either way they were yum so I’d make them again. Here is an interesting article about ANZAC and Subway. Click here to learn about golden syrup. 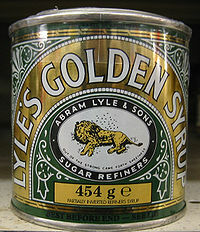 I have fond memories of my mum buying Lyle’s Golden Syrup when we were young. Delicious on pancakes.